The area in and around Victoria has historically been devoid of decent dining options. Bar a few exceptions like the ever-dependable A.Wong, there just hasn’t been much going on for the area food-wise given the heavy tourist and commuter traffic in and around the station. However, there’s now a new kid on the block that’s located just a stone’s throw away from the railway station. Housed in a charming Grade-II listed period mansion, Kouzu is the latest high-end restaurant to hit London’s Japanese dining scene. In conjunction with their recent opening, I was invited over by the restaurant to sample what they had on offer. 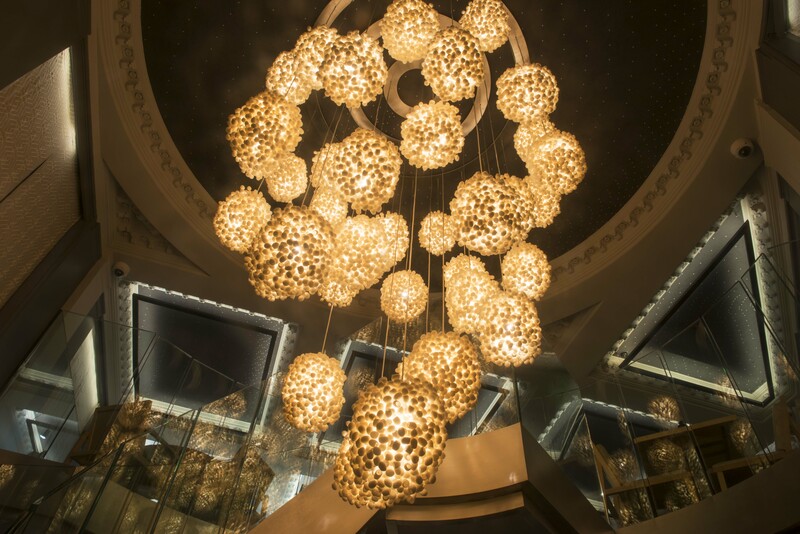 Take a step through their front entrance and what greets you is the most gorgeous and lavish of custom-made chandeliers. A network of glowing cocoon-like pods, its intriguing and almost hypnotic design resonates with the restaurant’s own butterfly logo. Spanning over two floors, Kouzu’s main dining area and bar is on the ground floor while the sushi bar can be found up the flight of stairs on the upper level. At the helm of the kitchen here is Japanese chef Kyoichi Kai, an alumnus of Zuma and The Arts Club on Dover Street. The menu offers a mixture of Japanese classics ranging from sashimi to tempura as well as ‘new stream’ dishes reminiscent of that you would find in Zuma where premium Japanese ingredients are given a contemporary twist. When a menu is as broad as it is here, it’s always good to have some direction from the front of house team. And confident and assured they were in their recommendations, sharing personal favourites and demonstrating a great knowledge of all the dishes. We selected a variety of both their modern and traditional dishes to sample. 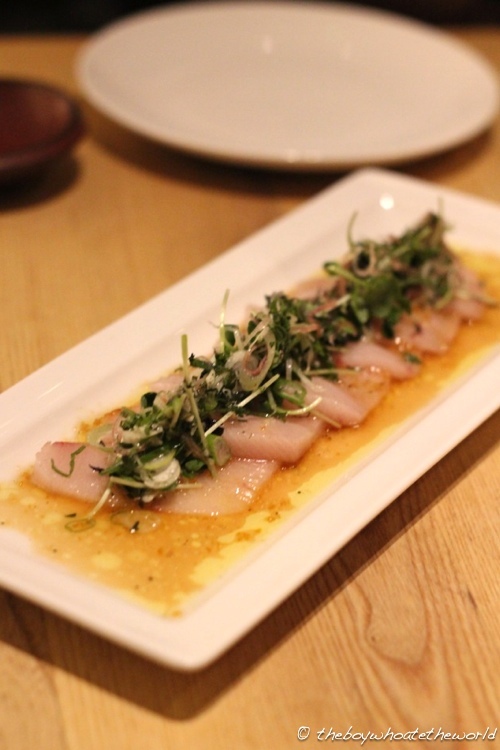 Of all the dishes we tried, their Yellowtail with truffle dressing was for me, the highlight of the entire evening. The thick-cut slices of fresh Yellowtail simply melted in the mouth whilst the tart, slightly earthy Ponzu truffle vinaigrette was subtle yet harmonious in flavour. 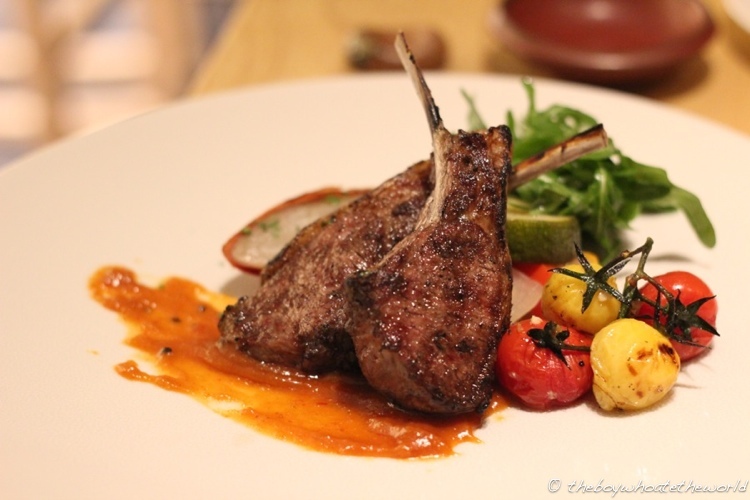 Lamb chops from their charcoal grill were tender and succulent – the spicy miso sauce on its own was definitely on the punchy side, but worked well when eaten with the smoky, chargrilled chops and sweet, slow-roasted vegetable garnish on the side. But there’s more to their dishes here than just the contemporary ‘new stream’ options. Our Chu-Toro Aburi Nigiri from their sushi bar was perfectly crafted – the delicate sear of the sushi chef’s blowtorch and fish roe topping brought out the sweetness in the fatty, velvet-like tuna belly. The other cuts of fish we sampled didn’t disappoint either. It’s safe to say there’s some top notch sushi and sashimi going down here that rivals any of London’s top Japanese restaurants. We moved on to sample a couple of their larger dishes from the ‘Specials’ section of the menu. Their Miso Black Cod was simply outstanding and one of the best I’ve ever tried. Not only was the fillet the size of a brick, but the huge, buttery flakes of cod were a match made in heaven with the subtle white miso sauce and refreshing fennel citrus salad on the side. Duck Breast with Sansho pepper sauce was less impressive. 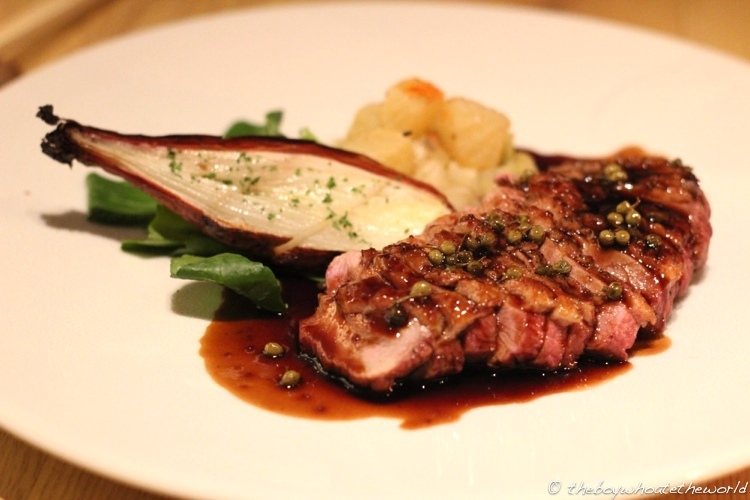 There was nothing particularly wrong with the cooking of the duck itself and demi-glace like sauce. I just thought the dish needed a few more Japanese elements and a bigger Sansho kick to differentiate it from just any other Europoean-style roast duck breast with peppercorn sauce. 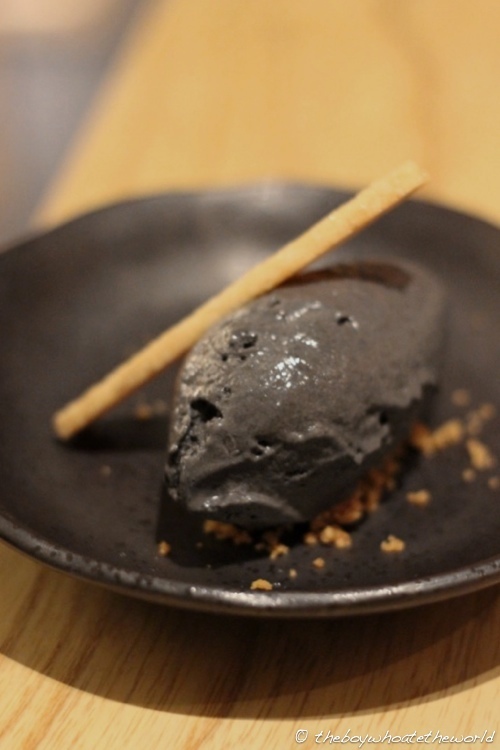 An aromatic, nutty and moreish scoop of black sesame ice-cream brought proceedings to a close. There were plenty of other modern plated desserts to choose from, but having sampled a fair number of their contemporary offerings already, what we were after was simplicity and this definitely delivered. On the whole, our experience at Kouzu was hard to fault and we thoroughly enjoyed the seamless mix of contemporary and traditional Japanese fare on offer. Despite being only in its infancy stages, I’d say the quality of the food here is already nearing the likes of heavyweights like Zuma and Nobu. 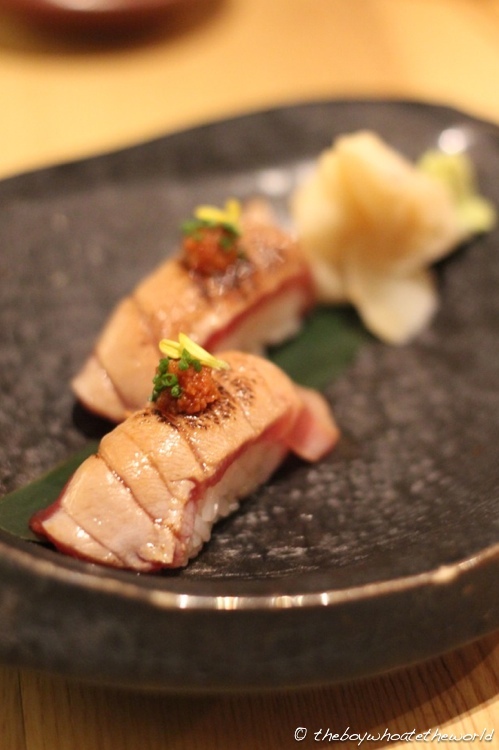 However, high-end Japanese food in London never comes cheap, and a meal here at Kouzu could easily set one back £50 – £75 a head depending on how much you want to splash out. Given the quality of the cooking and premium ingredients throughout though, I’d say the price tag is more than justified, especially if there’s a special occasion to toast. Plus, as far as Victoria & Belgravia goes, it’s certainly a welcome addition to a neighbourhood much in need of a gastronomic uplift. p.s. My thanks to the Kouzu team for the invitation.